Gone are the days where you had to drive to your local newsagency or petrol station to pick up a couple of scratch-n-win cards to try and make a quick buck, now thanks to the glory of the Internet you can play instant win scratchies online. No more standing in line or getting that messy opaque covering all over your hands and clothes as you use a coin to scratch to reveal the hidden panels. Online scratch cards are convenient, clean, hassle free and can be played to win real money any time of the day or night. Royal Vegas Casino : Royal Vegas has a huge range of Microgaming scratch cards available in browser-play mode or by downloading the premium casino software. Sign up for the first time and you’ll receive up to $1,200 in matched deposit bonuses. G’Day Casino : G’Day has a handful of popular instants available, which you’ll find under the ‘Fun & Scratch’ game category along with a bunch of keno variants. New players registering at G’Day are welcomed in the true Aussie spirit with up to $500 in matched deposit bonuses, 50 free spins and a slab of beer. Guts Casino : Guts has scratchies available from NetEnt, Microgaming and Play’n Go, all located under the ‘other’ games tab. Sign up and you’ll receive a $400 welcome bonus plus 100 free spins on the Starburst pokies game plus access to Guts’ huge promotional offers. Roxy Palace : Roxy Palace has a whole section dedicated to instant wins, where you’ll find a bunch of Microgaming scratchies and other arcade style games. Players receive up to $350 in matched deposit bonuses spread over your first two deposits. Thrills Casino : enjoy playing at one of the most beautifully designed casinos on the Web, where you’ll also find over 15 different scratch cards to choose from by a range of game developers. There’s also a $500 welcome package up for grabs which includes 100 free spins. How do Internet scratchies work? When purchasing a real scratch card, a coin or sharp object is used to scratch away the top layer of the card to reveal the hidden symbols lying beneath. The aim is to reveal matching symbols that will form a win, for example the appearance of three $50 symbols will result in an instant win of $50. 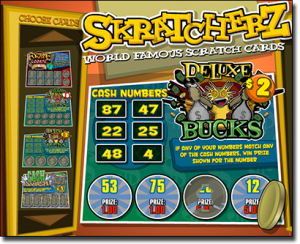 Just like their real life counterparts, online scratchies work the same way, the difference being that instead of physically scratching the card you simply click with your mouse to clear the hidden panels. 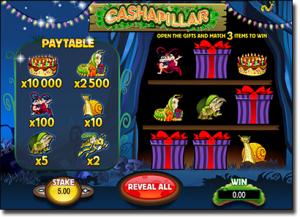 Given the electronic format, online scratchies use all kinds of vibrant animation, graphics and sound effects to make the play process much more engaging. When playing online, you have the choice of either clicking each panel individually to show the hidden symbol, or simply click the ‘reveal all’ button which will instantly reveal all the hidden symbols. Be mindful that using the ‘reveal all’ button means games can be completed within seconds, which can be a sure way to burn through your bank roll, so if you want your money to last longer it’s preferable that you click to reveal the panels yourself. All of these games can be played for free in demo mode so you can give them a go before deciding if you want to place any real money wagers. While there aren’t as many scratchie titles as there are the pokies, there are plenty of different instants to keep you entertained. When playing a real life scratch card, your odds of winning are based on the amount of physical tickets that have been printed, which means the house edge varies depending on the card you’ve purchased. For example, a $1 instant win card with a jackpot of $10,000 that has 70,000 tickets printed has a one in four chance of winning a prize. Real life scratchies come with some of the highest house edges you’ll find, similar to the lottery where the house edge is often at 30-40% (for comparison, the house edge in blackjack is around 1%). 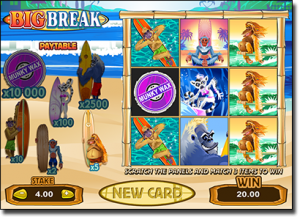 Online scratchies have much better odds because the costs of offering the games are much lower for Internet vendors, and there’s an infinite number of times the games can be played, unlike in real life where cards are limited to the print-run. Playing online instants also gives you the power to increase or decrease your wager, unlike real cards where each card has a standard purchase price. Keen to try an online scratch card for yourself? Follow our links to head to the best real money casinos on the net and you’ll also receive some awesome welcome bonuses.